Annabel Cohen is a writer, chef, cooking instructor, consultant and food-stylist known for her creative, global recipes and casual, cooking-instruction style. 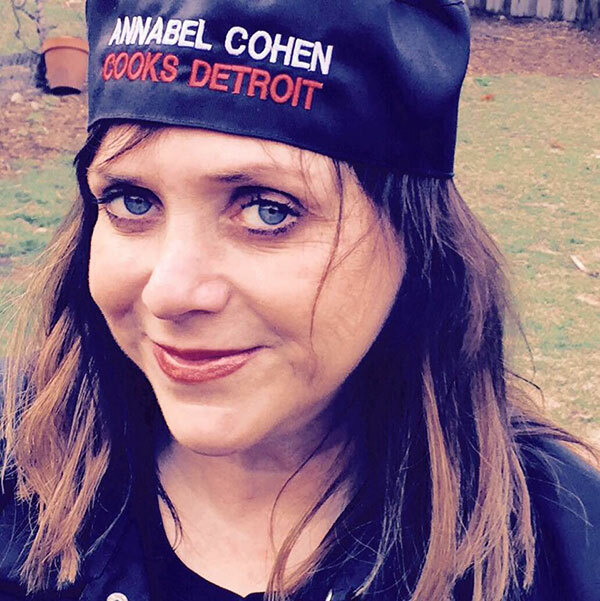 As the owner of Annabel Cohen Cooks Detroit catering company, she is as known for the artistic and elaborate tablescapes often created as backdrops for her food as she is for her delicious meals. A featured expert on subjects both culinary and lifestyle, she heard regularly on television and radio programs and can often be seen cooking on local news shows. She was selected by Crain’s Business Detroit as a one of the city’s most passionate cooks, has been profiled in various publications around the world and is often called up to judge food competitions in the Detroit area. I always loved to cook, since I was a young child. I hosted dinner parties in high school and elaborate feasts in my college dorm room. I was discouraged from actually going to any sort of cooking school, so I graduated with a BBA in advertising. I got my first “real” job as a copywriter before I even graduated, and I would host themed-food days at the ad agencies I worked for (Muffin Mondays, Waffle Wednesdays, etc.). I started catering executive meetings when I was at Campbell-Ewald (at the ripe old age of 25), and a career was born. My family is Brazilian and somehow Brazilian flavors pepper my repertoire, even though I’ve traveled extensively around the world. My favorite, by far, is cooking Feijoada (and all its accompaniments), a Brazilian black been stew served with rice. A close second is Paella — I think I make it better than most. And I serve it in my 3-foot wide paella dish (it’s something!). My favorite food is toast! (I always say it’s the best thing since sliced bread.) Simply with butter or any topping on the globe, toast never disappoints. To eat out, I adore Asian food – every year on my birthday I feast on Dim Sum. Anything made with lime, cilantro, ginger and garlic makes me swoon. Street food is always my favorite. (I joke that I’m the only American who ever gained weight in India.) That said, the most interesting single experience was eating in a private home in Croatia. It was in a centuries-old smoke house and cooked by the family’s matriarch. While it wasn’t the “best” meal, it was the most interesting. I love the big city/small town feel of Detroit. As a citizen of the world, I like that I can be one-on-one with a global community without being overwhelmed. And it’s the only city in the US that’s north of Canada. How cool is that! Everyone inspires me – I’m humbled so often. I’m awed by how just “scratching the surface” of many individuals, (of all walks of life) you’ll find that each has a talent/job/story/background that is so interesting. And really smart, artistic and curious people – they make me up my mind game. We discuss things, not people. When I can walk away knowing more than I did before, that’s a good day. My father is a cardiologist and my mother an artist – all kinds of smart in my family.